J.Crew’s Spring/Summer 2014 looks may not have been green (alas! 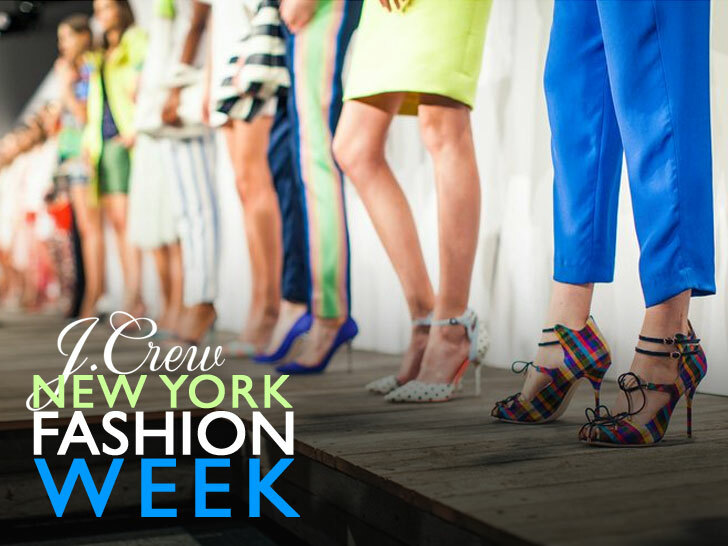 ), but the ground its models trod on at New York Fashion Week on Tuesday certainly was. The high-street retailer paved its runway at Manhattan’s Lincoln Center with reclaimed boardwalk woods from Coney Island, Rockaway Beach, and Atlantic City, providing a weathered counterpoint to Hawaiian-flower jumpsuits, paint-splattered cargos, and iridescent neoprene skirts that characterized the surf-themed collection. “It’s not only what you’re wearing—it’s what you’re wearing it on,” says Alan Solomon of Sawkill Lumber Co., which salvaged the timber following the devastating effects of Hurricane Sandy in October 2012. Despite being reduced to wreckage, the tropical hardwoods remain prized for their exceptional strength and durability. Despite being reduced to wreckage, the tropical hardwoods, which boast names like cumaru, ipe, and angelique, remain prized for their exceptional strength and durability, Solomon adds. “Harvested decades ago from the South American jungles, and hauled by elephant and ox cart before being milled into New York areas storied beachfront walkways, they now turn up at the forefront of American fashion—an unlikely but wholly appropriate transformation for the times,” he says. Sawkill will reclaim all woods from J.Crew’s Fashion Week installation, per the apparel firm’s request. Whoopy! Would be better if they spent their money on Upcycled or Recycled materials for their clothing than promotion. J.Crew's Spring/Summer 2014 looks may not have been green (alas! ), but the ground its models trod on at New York Fashion Week on Tuesday certainly was. The high-street retailer paved its runway at Manhattan's Lincoln Center with reclaimed boardwalk woods from Coney Island, Rockaway Beach, and Atlantic City, providing a weathered counterpoint to Hawaiian-flower jumpsuits, paint-splattered cargos, and iridescent neoprene skirts that characterized the surf-themed collection.